The largest biographical study to date of TV meteorologists shows some disturbing disadvantages for women in the profession. You can hear Alexandra Cranford, the author of that study, discuss the study on the latest episode of our podcast, AMS on the Air. Cranford, who is an AMS Certified Broadcaster with WWL-TV in New Orleans, made an exhaustive survey of online information for more than 2,000 weathercasters. 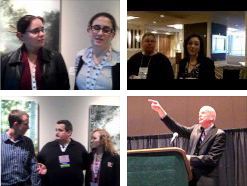 She focused on the relation between her colleagues’ professional status and education. 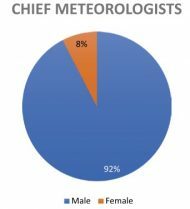 The results, which formed the basis of her BAMS article, show women meteorologists have made gains on local TV, yet are not proportionately well represented in the most prominent and prized positions on local stations. In the podcast interview, she speculates on some of the reasons for these findings. Perhaps when a hiring manager is interviewing a man versus a woman as a weathercaster, they are looking at slightly different criteria….Another thing is, maybe women are choosing for some reason…perhaps to work maybe weekends and mornings. Maybe women are staying away from those chief positions for some reason. I have no idea if this is the case—I’m just throwing out ideas here—but…possibly due to family reasons or personal preference. That could maybe be another thing. Also, women may choose to exit the industry earlier in their careers, so that leaves a pool of mainly older, more experienced, mainly males to fill those chief spots, which are typically filled by an older, more experienced person. And then, one of the reviewers of my study brought my attention to the effect that all of us think about—but how much of a real effect might it have?—the effects of criticisms of consultants and social media and so forth. We all know about the internet trolls. Anyone who works as a TV weathercaster, I’m sure has gotten emails from viewers….That’s a very real thing too. There is research that suggests maybe that’s a bit worse for females versus males. Maybe that can play a role as well. Listen to the whole interview on the AMS website or on your favorite podcast app.